The Feminine Demonstration of Scully in "Daydream" and "The Wedding"
Fan fiction can exist in media as diverse as prose, painting, and music, and is centered in a universe created by another person. Chris Carter’s The X-Files, originally set in a television series running since 1993, is one particular environment that has inspired a great many authors of fan fiction. The two lead characters, FBI agents Fox Mulder and Dana Scully, work to explain X-Files, cases involving paranormal or alien phenomena. They have always existed in an environment of sexual tension, prompting the creative involvement of devoted fans who create further storylines in various media. In looking at any sort of fan fiction, it is necessary to explore the author’s motivations and method of writing within that universe. Fan stories of The X-Files usually fall into the context of emotional intensification bordering on eroticization, which in itself frequently involves a genre shift to the generic model of romance (Jenkins, 1992, p. 174). This fiction is largely written by and for the (surprisingly large) female demographic, which is interested in the show. 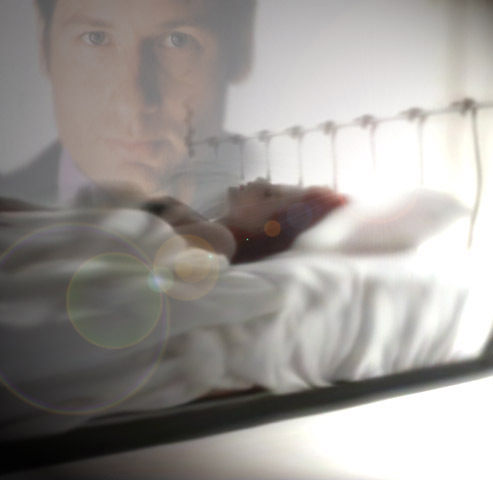 The subject then not only reflects upon the gender role of woman as sensitive nurturer and emotional being, but allows the characteristic "chick flick" emotional topics to enter into the X-Files environment, albeit in the artistic works of fans rather than in the original television media. This not only explains the surprising number of emotional topics in X-Files fan fiction, it also explains the recurring theme of the exploration of Scully’s feminine side, which is largely suppressed throughout the series. Tension between the fan desire for this exploration and the producers’ unwillingness to deliver it forces the fans to fulfill their desires with this additional media. I want to examine two fan created images in order to explore how the artists reveal the feminine side of Scully’s character – not as a reduction of her professional role as an FBI agent, but as a projected fantasy "demonstrating" a feminine aspect of Scully never shown on the television series. In "Daydream," we find a sexual reading of Scully’s character as she thinks about Mulder while lying in bed. In contrast, "Wedding" takes her relationship with her partner Mulder beyond a dream to a permanent commitment, which maintains a more conservative femininity of Scully. At the same time, these images allow the authors to perform fantasies of Mulder and Scully having a romantic relationship, a relationship that the producers of the series have yet to deliver, and probably will never happen. However, the specific interests guiding the rewriting style are provoked by the sexual tension between Mulder and Scully that has existed since the series began in 1993. Fans have been clamoring for a romantic entanglement between the two, and have been repeatedly teased by almost-kiss scenes and an occasional romance between one true character and one who is represented by a shape-shifter. [Note: They finally got a kiss on "Millennium," the fifth episode of the seventh season]. Such tantalizing has only instigated more fiction along these lines. Much of this art-based fan fiction comes in the form of computer altered graphics, illustrating the fan artist's depiction of an idealized romantic fantasy between Mulder and Scully. Reading these images like a text, it can be argued that the theme of these two creations reveals Scully’s femininity. I will analyze each image as a graphical lexia, examining the pictures as a whole, then breaking them down into minute detail. An interesting point about the overall scope of this picture is that Mulder and Scully are not physically together as they are often depicted in other fan photos. The author has successfully captured not only the assumed desire of Scully to be with Mulder, but also her own fantasy of having Scully be with Mulder, and indeed, in all likelihood, her fantasy of herself dreaming about Mulder/David Duchovny. This sort of meta-textual analysis (Jenkins, 1992) begins to reveal the image as a multi-layered exhibit, containing a deep structure and cultural significance. First of all, Scully is depicted as a sexual and feminine being, instead of Agent Scully as we see her every Sunday night on FOX. Depending on the interpreters’ point of view, she could be "reduced to" this state or "demonstrated in" it. The choice of "reduced to" would imply an inferiority of the feminine self to the professional self. The creator of the image is unlikely to have put a favorite character into an inferior position within the context of her graphical fan fiction, because what distinguishes this creator is her desire to see the characters sate their desire and pursue a romantic relationship. Her intent to create this reality through her artwork implies that the relationship is as valued or more valued than the professional relationship exhibited in the series. So rather than implying that her femininity is reductive or negative, it is likely that Scully is being demonstrated or shown as female, again reflecting the typical desires of the author and other fan fiction viewers exploring the non-professional side of their favorite character. The evidence for this portrayal lays all about the image. Obviously, the subject of her daydream and the physical locale in which she is having it imply a sexual connotation. Everything in Scully’s environment is white, a far cry from the dark austere suits portraying her professionally. The color also symbolizes in a larger cultural context purity, hope, light, good, and other abstract phenomena, which lead to a generalized classification of feminine. The sheets and blankets are white as well, and have a slightly rumpled effect which, combined with the lighting from the right side of the picture, suggests a light rippling, a softness, in contrast to a freshly-made bed with sheets stretched flat. Add to this the soft focus of the shot, and this mixture designates the femininity of Dana Scully in bed. Even the title, "Daydream," connotes a more innocent fantasy of lady-like demeanor, as opposed to a very vivid and detailed sexual fantasy that could have been as easily created. Scully’s fantasy cannot be left alone as just another daydream, however. First, although created by a woman, it reconfirms the culturally imposed stereotype that women are always thinking about men. Not only is she thinking about men, she is thinking of a specific man – her FBI partner. This depiction shows her turning, in her mind, a professional relationship into aspirations for romantic involvement. Interestingly, the artist has depicts Mulder as the consummate suit and tie professional that he is by day. Granted that this may have been due to the author’s lack of Photoshop skills or available shots of Duchovny, she is not even imagining herself with him. His daytime attire brings to mind sociobiological arguments for women wanting men as providers, not lovers – an ideal that ardent fans should complain about, since it is against Scully’s nature. The white sheets bear some further exploration here. They do indeed connote feminine traits in both color and texture in contrast with Mulder’s suit. His professional attire, the contrast between his suit and Scully wrapped only in sheets emphasizes the otherness and separation of the spheres they inhabit. The desire for romance and sexual strength of the image is intensified by the subtle placement of (what appears to be) her hand on her breast. The actuality of that image being her hand and not a bra or elbow is irrelevant once it has left the author’s hands. The mere suggestion that she is touching herself in conjunction with the daydream heightens the sexuality of the image and the expression of romantic desire that it conveys. Her facial expression with eyes closed, head tilted gently up in a coy, pleased expression, again suggests an implication of her sexuality and the femininity described above. Every aspect of the shot contributes to the fantastical ambiance of the image. The soft focus photography not only serves to disguise the true identity of the woman, but it is an element frequently used to create a chimerical or whimsical image because the softening of edges produces a dreamlike effect. The author of the image has also gone to some trouble to add camera flare sunspots to the image in several locations. Several concentric circular glares are located towards the center of the image, to the lower left of her body. They seem to glow like crystals or baubles right out of any fantasy or romance text. Another one is placed directly above her head, and glows radiantly, eliciting images of haloes and tiaras, commonplace items within the fantasy genre. The wiry bed frame which knots the horizontal wires to the vertical wires is shown only in silhouette, their outline suggesting perhaps tall palms. The rippling effect of the bedding, which contributes to the soft femininity of the room, almost borders the "trunks" of these trees, creating an illusion of waves lapping at the shore. The juxtaposition of the bright sunspot against what would be the horizon adds to the paradisaical landscape illusion. Of course, such perfect landscapes exist only in one’s imagination. The whole picture is a fantasy. Beyond the fact that it is an imaginary environment, and beyond Scully’s daydream, it is still a fantasy shot. It reflects the fantasy of many fans to see the two of them together and lusting for one another, and reflects the fantasy and (day)dreams of the author of this image and her desire. The author may indeed have participated in the ultimate fantasy here: the woman lying in the bed bears a passing resemblance to Gillian Anderson (Scully), but I haven’t found anyone yet who believes it is really her. If the author has planted herself within this picture, she has become Scully within this text, a variation of the "Mary Sue" stories. This genre of fan fiction allows the author entrance into the imaginary environment to "efface the gap that separates the realm of their own experience and the fictional space of their favorite programs" (Jenkins, 1992: 171). Instead of casting herself as a rookie agent or other costar as is done in most Mary Sue stories, she has graphically supplanted herself into the main role. The viewer is only led to believe that this is Scully by an approximate profile and a shock of red hair reflecting the light outside of the viewing angle. The wonderful trick of soft focus blurs the woman’s silhouette just enough that the resemblance is uncanny, and once Mulder’s face is recognized, she is immediately seen as Scully. This picture as a cultural text extends past the point at which "Daydream" left off. Representation of a wedding indicates a romantic relationship that has progressed beyond mere daydreams. The key difference is that this image brings Mulder and Scully out of the universe in which they were created and into our own and also invites the viewer to join this fantasy. Other graphical lexia available within the image provide a deeper understanding of the context of the picture within the X-Files universe and the real world. Whereas "Daydream" brought the artist into Mulder and Scully’s world, "Wedding" brings them out of the imaginary entertainment environment and into our existence. 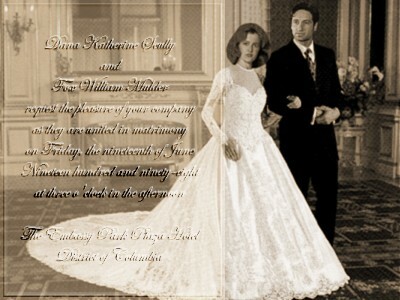 The text of the invitation reads that "Dana Katherine Scully and Fox William Mulder request the pleasure of your company as they are united in matrimony on Friday, the nineteenth of June nineteen hundred and ninety-eight at three o’ clock in the afternoon – The Embassy Park Plaza Hotel District of Columbia." Washington, DC has always been a key setting for the television show, but appears on the invitation as a component as important to the wedding as who will be married. Its importance is distinguished even further by the use of the Embassy Park Plaza, a real hotel, as the site of the wedding. The viewer connects the hotel with the background setting of the invitation picture, such that the city and the hotel come to life as key actors in the wedding. What makes this so real is the view we have of the locale – a fancy hotel-like background occupies more than half of the picture, bringing it to life in our reality. It is further separated from the typical X-Files environment by the décor. The X-Files occurs in some unusual and diverse locales, but the gilded hotel look isn’t among them. The event itself extricates itself from Mulder and Scully’s environment. Just as the setting shown doesn’t occur in the show, neither do weddings – it’s science fiction, not a soap opera or harlequin romance. The photographic technique can also be compared to that used in "Daydream," the contrast between the two further exemplifying how "Wedding" has been brought into the real world. Most noticeable, the sepia tone of the photograph is rarely used in the context of television. It evokes a reality and history that is inconsistent with the modernity of television in general and of this series in particular. This is in stark opposition to the whites and light greys present in "Daydream." The lack of special effects included by the artist brings this image even closer to our reality. The soft focus and sunspots that defined the dream-like qualities of the first image are absent here, anchoring the event firmly within reality. The recurring theme in this image and in "Daydream" is the consideration of Scully’s femininity, as compared to the professional persona that has been carefully developed in the television series. The femininity described by this image is a much more traditional femininity than shown in "Daydream." Scully here is a more conservative, much less sexual being than previously shown. As with the first image, the differences are emphasized in dress and posture. Mulder, at his own wedding, isn’t even wearing a tuxedo. He’s dressed in the same sort of suit he wears every episode, resulting in a lack of differentiation between the Mulder at work personality and the Mulder at home. This lack of differentiation also occurs in "Daydream." Scully, in contrast, is not in the sensible suits she wear when working with Mulder. She’s wearing an ultra-feminine wedding gown. The curves emphasize her chest and feminine form. The wide skirts remind the viewer that this is a dress on a woman. The lexia that refers indirectly to her sexuality is again the placement of her hand on her hip. The woman’s hip brings to mind childbearing, and this interpretation is strengthened by the shadowy formation of a stomach above her arm. For the same reasons as considered for "Daydream," it is unlikely that the author intends to demean Scully’s character by portraying her as more feminine. Any fan invested enough in an imaginary environment to create fan fiction around it, as stated earlier, is not motivated by the idea of depicting the characters in a defamatory situation out of which they cannot rise. The more traditional setup, characterized by the sepia tones of the photograph and by Scully’s costume, imply a more conservative take on femininity. In this case, the author has not put herself physically into the picture, but has manifested her values in the image through her ideals on Scully’s non-professional traits. The same contrast of dark and light in costume that was seen in "Daydream" is also seen here. Scully’s white dress is uncharacteristic of her as she has been developed in the television series. A very conventional cut for a wedding dress, with a long gown and tight bodice, again emphasizes the separate spheres that the author envisions Mulder and Scully inhabiting. The sepia-tone works here again by suggesting the nostalgia for the conservative femininity that has since been culturally encoded as a standard at the time sepia-tone was popularly used in photographs. These images are only two of many that reveal fans' relationships with The X-Files, one of many imaginary entertainment environments that fans participate in, and are defined as "fictional settings that change over time as if they were real places and that are published in a variety of mediums (novels, films, role-playing games, etc. ), each of them in communication with the others as they contribute towards the growth, history, and status of the setting" (Mackay, 2000). Fan authors and artists contribute to the history and culture of The X-Files by creating works published on world wide web. Fans are not just consumers of culture, they are participants of it. Here, a fan contributed to the development of Scully’s femininity, which is virtually untouched during the regular television series. Despite the fact that these romantic narratives depicted in these images may never appear on the television series, the fans' work extends the history of these characters beyond the producers' television series and reveals that the show really belongs to the viewers, the fans of The X-Files, for they are the ones who will continue to create new narratives as the series ultimately ends. Jenkins, Henry. Textual poachers: Television fans and participatory culture. New York and London: Routledge, 1992. Mackay, Daniel. The Dolorous Role: Toward an Aesthetic of the Role-Playing Game. Jefferson, NC: McFarland, 2000.